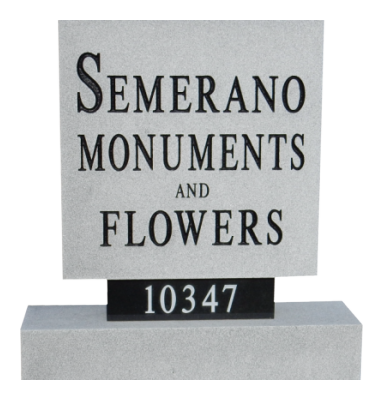 Semerano Monuments has not only committed itself to providing the highest quality memorials but has also assured that its work is reflective of skilled craftsmanship and artistry. Family owned and operated, it also specializes in creating uniquely designed memorial works by emphasizing a person's individuality, a tradition since 1947. Today, we are dedicated to carrying out these promises. We take the time to make sure our customer is satisfied with their loved one's memorial. They not only purchase the memorial but are also involved throughout the process. Their satisfaction is guaranteed. Our relationship with the customer does not end when the memorial is completed. In addition to monuments, we also provide flowers and engraved wooden crosses. If you would like to receive information, call or visit our store conveniently located across the street from All Souls Cemetery.